With Nest Sense, the Nest Thermostat learns about your house. Like how long it takes to warm up, how drafty it is, and what the weather's like. It also learns about your heating or cooling system and how to make it even more efficient. So while you turn up the thermostat or turn it down, Nest Sense algorithms are figuring out a thousand things in the background. Airwave: With Airwave, your AC takes a break and the fan takes over. It spreads the cool air already in your system through your home, saving energy. Sunblock: Sunblock notices when Nest is heating up in direct sunlight and will automatically adjust so it still reads and sets the right temperature. Cool to Dry: With Cool to Dry, the AC kicks in to make the air a little less humid. Early On: Early-On will figure out when to turn up the heat so you'll wake up to a perfectly warm house. True Radiant: If you have a radiant system, True Radiant keeps the heat at a steady, even temperature without overshooting. Heat Pump Balance: If you have a heat pump, the Nest will make sure it keeps up with the cold, or it will give it a boost with AUX heat to keep you cozy. When the Nest Learning Thermostat spots you across the room, it lights up to show you the time or the temperature you set. You can even choose a digital or analog clock face. You'll see the Leaf when you choose a temperature that saves energy. Additionally, the Nest Learning Thermostat shows you how much energy you use every day in Energy History and every month in your Home Report. So you can see when you use more energy and how to use less. You can control up to 20 thermostats per home. They'll work together to save energy and coordinate Auto-Away. 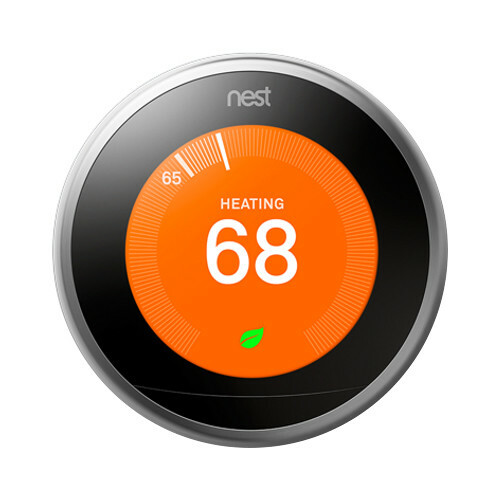 Additionally, you can control the Nest Learning Thermostat in two locations from one Nest account. Check the temperature in your office and turn up the AC on your way there. Press the display and turn the ring and you can easily access settings, energy history, or your schedule. Box Dimensions (LxWxH) 6.65 x 6.65 x 3.2"
Learning Thermostat (3rd Generation, Stainless Steel) is rated 4.9 out of 5 by 6146. Rated 2 out of 5 by Anonymous from Home/Away Assist fail The Home/Away Assist (geo fencing) was the main reason I bought this. To learn that it was unstable in functionality was a big let down. Nest support not sure what was causing the issue maybe it was still learning. Support site steps followed here https://nest.com/support/article/Troubleshooting-Home-Away-Assist, does not work. Nothing on the support site states that the learning period could be a reason for home/away assist to fail. I only have Nest Thermostat and all it has to do is figure out if phones set are in range or not - I'm not sure what's there to learn. I detect when I or my spouse arrives 100% so i'm not sure what gives. Its definitely buggy. Rated 5 out of 5 by Anonymous from Peace of Mind We had to update a furnace that went out after 60 years of service in our home and decided to upgrade our thermostat at the same time. Best decision ever! I love having the ability to connect to my Nest thermostat remotely through my app and adjust as needed. Our heating and cooling professional installed our new Nest with limited issues and was able to walk us through the setup quickly and easily. The sleek design looks great on our wall and the display only lights up as you approach, not calling attention to itself. We are so happy with this upgrade and are eager to upgrade our second thermostat for our upstairs in the next few months. Rated 5 out of 5 by BamaDen from I love my Nest thermostat The Nest thermostat is such a modern improvement in my home. It was easy to install, works great and can be adjusted anywhere from my smartphone. I like having the ability to adjust from my master bedroom, before going to bed or just getting up in the morning. It also learns your habits for automatic adjustments keeping household heat or cooling efficiency. Very modern and would install in every room, but not needed. Looking into other Nest products because they work so well look great and make my home smart. I can also monitor the heat or cooling on times, hours of use and in the couple of months I've owned it has saved me money. Thanks Nest. Rated 5 out of 5 by Tammy from Money Saver! We initially purchased the nest for our vacation rental. It has a nice clean sleek look and gives us the ability to adjust the temperature up before guests arrive and down when the house will be vacant remotely via a phone app. Super easy and convenient. The app is an asset for our situation since we're several hours away from our rental. We loved it so much we bought another and replaced the one at our primary home. We use more the scheduling features and a connection to the phone at that location so it "knows" when we're home or away and adjusts accordingly. It's been a great investment and paid for itself a few times. Highly recommend!!! Rated 5 out of 5 by CraigV from Easy Nest Thermostat I was a bit skeptical when first purchasing the Nest thermostat but have come to love it. The ease of installation to setting and using is great. In a very short time the thermostat 'learned' my temperature likes and times. I really enjoyed not having to set up a multi day program as days do tend to differ and this self learning thermostat has really been great. With all that said the feature I have found to be the best part of it all is the smart phone app. Having the ability to set the temperature to start warming the house up when coming home at different times is awesome. Really enjoy this product and the ease of installation to using it! Rated 5 out of 5 by Anonymous from LOVE IT!! I initially had no interest in getting this thermostat but my parents had it for a few years and insisted I would love it! They ended up getting me one for Christmas and I absolutely LOVE it! I no longer have to worry when I’m at work or gone for the day that I forgot to turn the heat down again! When I’m heading home from work I turn it up with my phone so it’s nice and warm when I get home. I love this is all on an app I can control from my phone! Also when I wake up in the morning it’s awesome I can turn up the heat while I’m still in bed! It’s a fantastic product and I’m glad they talked me into it! Can’t wait to try it this summer with the AC! Rated 5 out of 5 by Mary K. from NEST LEARNING THERMOSTAT I replaced a Mechanical Programmable Thermostat that was troublesome and stopped working. I received the NEST Learning Thermostat as a gift from family member and have no problems. I am very pleased with the responsive control for setting the temperature range for heating and cooling control while I am at home. I have replaced my existing Fire and Smoke Alarm after ten years of use with the Nest Protect (smoke and CO alarm ) because the Learning Thermostat will work with the Nest Protect. I am impressed with the light path available during night when I need to check household access. Thank you for this improved product that works with human beings. Where does s1 and s2 connect? Do not use the red and white wires that are in S1/S2 on your old thermostat, these are external sensor wires and Nest gets the internal temperature reading from its ambient temperature sensors and the outside temperature from your Wi-Fi connection. Can you use the Nest in Australia? how is it compared to the last generation? the 2 3G nest that I bought came without the heatlink that apparently is a must to connect a 3 zones heating system. What should I do? I couldn't find a separate heatlink to buy. What happens when your internet is down? Can I control it manually? I don't see why you couldn't. All you need is an Internet connection (wifi) and the app on your phone. The thermostat itself will need a 12v power connection at the mounting location in your home as well. Definitely. Lots of setting and HVAC system options.